T.F. Noonan’s is a 1500 square foot pub located on Central Ave. in Pearl River,NY. Named after the fictional character Terry F’n Noonan from the cult classic film State of Grace, Noonan’s opened its doors for business on May 12, 2001. Known for its cozy and comfortable atmosphere as well as most professional bartenders, Noonans has something to offer every age group. TF noonans has 16 tap beers and 18 bottled beers, so there is sure to be a flavor for everyone. Sixteen flat screen HDTV’s hosts sports fans providing the NFL Sunday ticket, ESPN Game day, MLB extra innings, NHL Center Ice and the mega march madness all through satellite on direct tv. 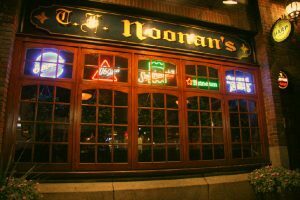 Noonans serves one of the most affordable and high quality pub menus on the west side of the Tappan Zee Bridge. Known for the oversized and juicy Burgers as well as the best big wings in town, there is something for all sized appetites. The kitchen remains open every night until 3AM, serving a full menu. We Also Host Pearl rivers only heated outdoor patio. The beer garden also has 15 HDTV flat screen televisions so you will be sure not to miss a moment of the action. Proper attire of course is required at all times, with neat and casual attire. All major credit cards are accepted and there is an ATM on premises for your convenience.